Подсушивающие бункеры серии SHD-U применяют дизайн выдува горячего воздуха и используют бункеров, сделанные из нержавеющей стали, чтобы избежать загрязнения. Благодаря такой конструкции, они также идеально подходят для использования с сотовыми осушителями для сушки инженерной пластики. Есть 25 моделей, размером от 20 до 8000 литров. Microprocessor is used for accurate temperature control. Digital P.I.D. temperature control with LED display. Overheat protection to ensure reliable operation. 7-day automatic start/stop timer to improve energy saving. Unique design of downblow air pipe can spread hot air evenly, keeping plastics dry and temperature stable to raise drying efficiency. Models SHD-80U and above have material clearance door to make the clean more convenient and effective. 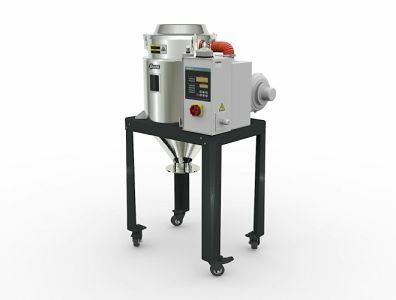 SHD-450U and models below are equipped with stainless steel lining aluminium base. SHD-600U~1200U are equipped with aluminium magnetic base. SHD-1500U and model above are equipped with manual butterfly valve. Floor stand and safety protective ladder are standard equipments for SHD-1500U and models above. Safety protective ladder is optional for SHD-1500U and models above. SHD-U-HD heatless dehumidifying hot-air dryer, fit with heatless regenerative device, which can supply dried air with relative low dew-point for speedup materials drying. SHD-U-HD heatless dehumidifying hot-air dryer, standard with hot air recyclers, which can save energy effectively. 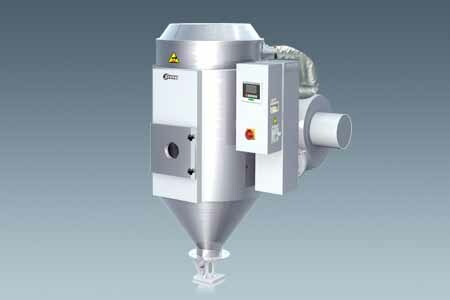 Without dust discharging, which ensures environment protection.